WHAT: MULTI-PLATINUM global entertainers FLORIDA GEORGIA LINE will headline the World’s Biggest USO Tour next Wednesday (9/12), at The Anthem in Washington, D.C. Throughout the first-of-its-kind music event, watch parties will unite the home base with more than 80 USO Centers around the world, plus Nashville’s FGL HOUSE. The multi-level venue will livestream the can’t-miss concert across all four floors, while welcoming service men and women from Nashville and Kentucky’s Fort Campbell as honored guests. Fans are also welcome to join FGL and friends at home, by visiting the worldwide livestream, as well as on social media via #USOTour2018. Actor-comedian Adam Devine and celebrity chef Robert Irvine round out the stellar lineup as USO tour alums, with Devine serving as emcee for the program. 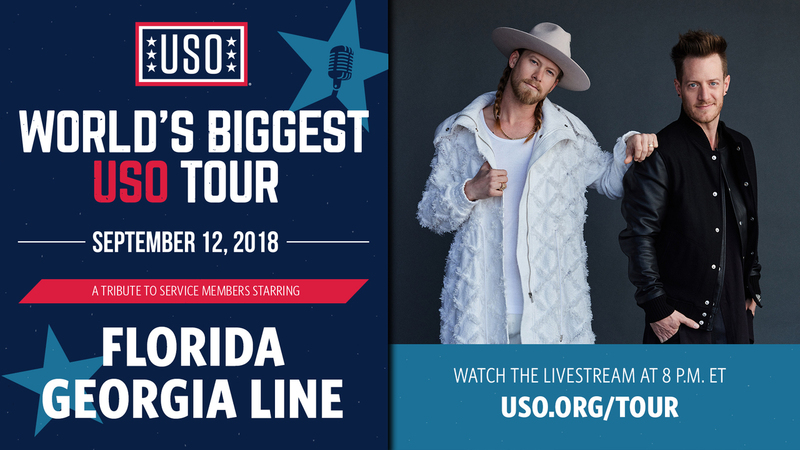 In anticipation of the one-night-only landmark event, watch Florida Georgia Line share their personal connection to the USO ahead of the World’s Biggest USO Tour here. WHEN: Wednesday, September 12, 2018. FGL HOUSE's hours of operation: 11 a.m.-3 a.m. (CT) and the livestream of the World’s Biggest USO Tour begins at 7 p.m. (CT). WHY: FGL HOUSE (operated by TC Restaurant Group) joins the USO in their continued support of our nation’s men and women in uniform. The World’s Biggest USO Tour featuring headliners Florida Georgia Line brings an exclusive and immersive look into what drives the USO’s 77-year mission to strengthen service members by keeping them connected to family, home, and country. In addition, this unique engagement will raise awareness about the great work delivered by USO locations worldwide. Brian Kelley and Tyler Hubbard (of BMLG Records’ MULTI-PLATINUM superstar duo Florida Georgia Line) opened FGL HOUSE in June 2017. Founded in partnership with TC Restaurant Group, the 22,000-square-foot, 4-floor giant reigns 3rd Avenue South in the music mecca of downtown Nashville. Hailed as “one of the finest establishments” (Fox & Friends), keen attention to detail is exemplified in the hand-welded wrought-iron railings, cast-iron instrument chandeliers, reclaimed barn wood walls, and personalized street art mural walls. Fusing delectable Southern cuisine with unique California flair, FGL HOUSE’s signature Cajun Fish Tacos were spotlighted inPeople Magazine, with additional notable looks such as Good Morning America and Us Weekly. Complete with a jumbo video wall, seven bars and two stages, the ultimate entertainment destination boasts the city’s largest “Cruise Rooftop” bar – as seen in a televised performance with FGL and The Chainsmokers during the 2017 CMT Music Awards, and vibey ‘90s-style basement level lounge, Little Red Corvette – which includes a baby grand piano, sunken marble dance floor, and infinity ceiling. Dedicated to an all-day and all-night party, FGL HOUSE hosts nightly live music plus “Sundaze Brunch” listed among recurring weekly events. MEDIA: For questions regarding the USO, please contact Chris Stagner at 571.385.1363 /cstagner@uso.org. If interested in covering the event, please reach out to Jensen Sussman (Sweet Talk Publicity) at 615.320.9616 / jensen@sweettalkpr.com. NASHVILLE, TENN. (June 4, 2018) — MULTI-PLATINUM superstar TYLER HUBBARD of Florida Georgia Line and his wife HAYLEY HUBBARD are going to the mat for a good cause during this year’s CMA Fest, hosting a SIP & SWEAT morning of refreshing drinks and rooftop yoga at downtown Nashville’s FGL HOUSE. Taking place on Sunday, June 10, at FGL HOUSE’s vibey Cruise Rooftop – located on 3rd Avenue South in the heart of CMA Fest – fans are invited to enjoy a star-studded yoga class led by instructor Danielle Whitener of Freebird and then a round of delicious Palomas, with ticket proceeds benefiting the CMA Foundation’s efforts to improve and sustain music education programs around the nation. Sponsored by Dulce Vida Spirits, Snap Fitness, and Topo Chico, the invigorating SIP & SWEAT event will kick off at 8 a.m. CT sharp with Music City MC Donald Jenkins on tap to keep the energy flowing. A few surprise celebrity guests and friends of the Hubbards will also join in the festivities. “Snap Fitness is thrilled to sponsor SIP & SWEAT – Palomas & Rooftop Yoga with the Hubbards! Delivering the best fitness experiences in the world is what we do, and nothing gives us greater joy than taking our mission outside the walls of our clubs and into the community for a good cause,” said Caitlin Tvrdik, Director of Marketing, Lift Brands. A limited number of tickets for the Hubbards' SIP & SWEAT are available now athttps://fglhouseyoga.eventbrite.com. All attendees will receive a yoga mat and water bottle. Click here for more information about CMA Fest and the CMA Foundation. To learn more about FGL HOUSE, please visit fglhouse.com. Established in 2011 as the philanthropic arm of the Country Music Association (CMA), the CMA Foundation is committed to improving and sustaining music education programs across the United States, working to ensure every child has the opportunity to participate in music education. Through strategic partnerships, professional development and grant distribution, the CMA Foundation, a nonprofit 501(c)(3), has invested more than $21 million in over 85 programs across the national public school system, after school programs, summer camps and community outreach organizations. Guided by the generosity of the Country Music community, proceeds from CMA Fest, the four-day long music festival held annually in Nashville, are used to power the CMA Foundation’s social impact and unique model of giving. For more information visit CMAfoundation.org. Dulce Vida Spirits was formed in 2009 in Austin, Texas, and hails from the Los Altos region of Jalisco, Mexico. The 80 and 100 proof variants are USDA certified organic and handcrafted from 100% Blue Weber Agave with a lineup of quality tequila including: Blanco (80 proof + 100 proof), Reposado (80 + 100 proof), Añejo (80 + 100 proof), Lone Star (100 proof) and a 5-year Extra Añejo (100 proof). Infusing real fruit and all-natural flavors, Dulce Vida Spirits also creates low-carb, low-calorie flavored tequilas: Dulce Vida Lime, Dulce Vida Grapefruit and Dulce Vida Pineapple Jalapeño. Dulce Vida Spirits are currently sold in more than 35 states. For more information about Dulce Vida Spirits, visitwww.dulcevidaspirits.com. Follow along on Facebook, Instagram and Twitter. With 2,000 clubs open or in development in 19 countries, Snap Fitness is the world’s premier 24/7 fitness franchise. Founded in 2003 by Peter Taunton, Snap Fitness provides entrepreneurs an exciting business opportunity with cutting edge fitness experiences, full-spectrum business support, and opportunities for continued growth. Founded in 1895, Topo Chico is a brand of sparkling mineral water sourced and bottled in Monterrey, Mexico. Topo Chico was sold only regionally in Northern Mexico but in the early 80’s the company expanded its distribution to a point where it was widely available in all of Mexico and it started exporting to the U.S. in 1987. Our Mineral Water is extracted from a spring at the foot of Cerro del Topo Chico or Small Mole in English, its name derived from the shape of the mountain. Thanks to its natural mineral composition, Topo Chico is a refreshing zero calorie beverage that quenches thirst, and can add a delicious accent to your drink when used as a mixer in alcoholic or non-alcoholic beverages. Enjoy Topo Chico with salt, lime, fruit juice, your favorite alcohol, and, of course, by itself! Redefining what’s possible in Country music, global superstars Florida Georgia Line continue to push full-throttle into uncharted territories with history-making collaborations, fresh entrepreneurial ventures and bold new music while currently in the studio. Crushing record-breaking milestones, the MULTI-PLATINUM duo has heavy-hitting spotlights on Bebe Rexha’s “Meant to Be” [#1 on the Billboard Hot Country Songs chart for 27 straight weeks and 14th #1 overall as artists], Hailee Steinfeld & Alesso’s “Let Me Go” (ft. watt), Morgan Wallen’s “Up Down,” and The Chainsmokers' “Last Day Alive.” Fueling their groundbreaking momentum, FGL’s 2016 PLATINUM-certified album DIG YOUR ROOTS (BMLG Records) delivered three consecutive #1 smashes: 4X PLATINUM-certified “H.O.L.Y.” and PLATINUM-certified hits “May We All” (ft. Tim McGraw) and “God, Your Mama, And Me” (ft. Backstreet Boys). THE SMOOTH TOUR 2017 marked their first time headlining select sold-out stadium dates – featuring special guests Backstreet Boys, with critics' reviews boasting: “Just in case you’ve forgotten, Florida Georgia Line is one of the hottest country acts alive” (MusicRow Magazine). With over 30 million tracks and more than 4.2 million albums sold worldwide, the top-shelf entertainers remain the first and only Country act to achieve RIAA’s DIAMOND certification (10 million copies sold) for their breakout “Cruise,” which is the best-selling digital Country single of all time (SoundScan). Since 2012, FGL has earned prestigious honors from the AMAs, ACM Awards, CMA Awards, Billboard Music Awards and CMT Music Awards. As true visionaries, FGL's innovative endeavors also includes their own Old Camp Peach Pecan Whiskey, plus the newly announced multifaceted compound in Nashville: Tribe Kelley Trading Post, Tree Vibez Music, and meet + greet, as well as FGL HOUSE. In addition to their supercharged music festival appearances this year, they will kick off the inaugural FGL Fest with a concert inside Turn 4 of the historic oval during the Indianapolis Motor Speedway’s 25th annual NASCAR weekend on September 8. For more information about Florida Georgia Line and upcoming tour dates, please visitfloridageorgialine.com and reach out on Facebook, Twitter and Instagram. Superstar duo Florida Georgia Line and pop idols Backstreet Boys spent the summer combining their voices on THE SMOOTH TOUR 2017 and a special taping of their joint CMT CROSSROADS episode, but the spirit of their camaraderie has extended far past the airwaves. FGL’s downtown Nashville entertainment venue and restaurant FGL HOUSE will host the official CMT Crossroads premiere event tonight (8/30) beginning at 7 p.m., but upon witnessing the devastation throughout southern Texas in the wake of Hurricane Harvey, the evening has evolved into a fundraiser benefiting the American Red Cross storm relief efforts. The FGL/Backstreet Boys CMT Crossroads will be played on screens throughout the entire four-level restaurant, including the main floor’s massive video wall and “Cruise” Rooftop Bar. American Red Cross representatives will be onsite to assist in patron donations. The viewing party is open to the public and attendees who donate a minimum of $25 per person to the American Red Cross will gain entry to the VIP Viewing Party in Little Red Corvette, FGL HOUSE’s basement lounge that celebrates the music and spirit of the 1990s. The VIP Viewing Party will include complimentary hors d’oeuvres and a raffle entry for giveaways including a CMT Crossroads poster signed by FGL and Backstreet Boys, FGL autographed drumhead, and an FGL HOUSE gift basket. The first 50 supporters will also receive an FGL tour t-shirt. CMT Crossroads featuring Florida Georgia Line and Backstreet Boys airs tonight (8/30) at 10 p.m. ET / 9 p.m. CT. Located at 120 Third Avenue South, FGL HOUSE is four levels of entertainment and dining from MULTI-PLATINUM hitmakers Florida Georgia Line. Bars on each floor serve local craft beers and inventive cocktails. For more information, visit FGLHOUSE.com. FGL’s PLATINUM-certified musical evolution, DIG YOUR ROOTS, propelled the history-making duo to #1 on the all-genre Billboard Artist 100 and Country Albums charts. Continuing the epic momentum, the album has delivered three consecutive #1 smashes - the 3X PLATINUM-certified lead single “H.O.L.Y.” [#1 on Billboard's Hot Country Songs chart for 18 straight weeks] and PLATINUM-certified hits “May We All” (featuring Tim McGraw) and “God, Your Mama, And Me” (featuring Backstreet Boys) [13th #1 overall as artists]. Following a landmark DIG YOUR ROOTS TOUR that broke attendance records and played to over one million featuring headline-grabbing guest appearances, FGL is currently on THE SMOOTH TOUR 2017. Bursting with first-rate reviews of their explosive live shows, MusicRow Magazine praised, "Just in case you’ve forgotten, Florida Georgia Line is one of the hottest country acts alive.” The superstar duo continues to crush records as the first and only Country act to achieve RIAA’s DIAMOND certification (10 million copies sold) for their breakout smash “Cruise,” which is the best-selling digital Country single of all time (SoundScan). Since their breakout in 2012, FGL has earned prestigious honors from the AMA, ACM Awards, CMA Awards, Billboard Music Awards and CMT Music Awards. Their previous BMLG Records releases – 2X PLATINUM debut HERE’S TO THE GOOD TIMESand PLATINUM ANYTHING GOES – have attributed to sales surpassing 30 million tracks and more than 4.2 million albums worldwide. FGL will spread good vibes to sports fans each week during the 2017 NFL season as they’re featured alongside Hank Williams Jr. and Jason Derulo in “All My Rowdy Friends Are Coming Over Monday Night” during Monday Night Football on ESPN. Fueled by fresh inspiration and keen entrepreneurial spirit, they’ve launched publishing company Tree Vibez Music and their own emoji app, FGLmoji. Following the introduction of their Old Camp Peach Pecan Whiskey, their premiere restaurant and entertainment destination FGL HOUSE, a four-story attraction with the largest “Cruise” rooftop Nashville has to offer, is now open. LRC Restaurant Nashville LLC, an Ohio-based company, operates restaurant venues in the Nashville area including; Sun Diner, Luigi’s City Pizza, Crazy Town, Tequila Cowboy and Wanna B’s Karaoke Bar. NASHVILLE, Tenn. (August 16, 2017) – It’s always a party at superstar duo FLORIDA GEORGIA LINE’s Nashville restaurant FGL HOUSE, and now the multi-level entertainment destination is offering the ultimate weekend wind-down with SUNDAZE BRUNCH, every Sunday from 10 a.m. – 2 p.m. CT.
Watch a special invitation from FGL here. The exclusive brunch menu, developed by Executive Chef Tomasz Wosiak with TC Restaurant Group/LRC Restaurant Nashville, features dishes reflective of FGL House’s culinary philosophy where Southern fare gets a California twist. Offerings include the FGL Chicken Waffle, Farm Fresh Flatbread, and hearty Country Cast Iron egg skillet. Brunchers can sip on signature cocktails such as the Ultimate Bloody Mary, topped with shrimp cocktail, bacon, cheddar cheese, pickles, olives, and celery. There’s also the Tipsy Daycation Mimosa – FGL House’s playful take on the brunch staple – featuring crisp champagne with orange juice and an orange popsicle. The full FGL House menu is also available during brunch hours (10 a.m.-2 p.m.) and boasts the restaurant’s delectable fish tacos – as recently highlighted in People Magazine. With a giant video wall and screens throughout, FGL House SunDaze Brunch is the perfect watch-spot for Sunday sporting events. Also on the FGL House calendar is the SUNGAZE ROOFTOP ECLIPSE PARTY Monday (8/21) at 11 a.m. with free entry. Attendees can take in the historic total solar eclipse from the “Cruise” rooftop – downtown Nashville’s largest – with a “Get Your Shine On” cocktail in hand. Eclipse viewing glasses will be provided. Located at 120 Third Avenue South, FGL House is four levels of entertainment and dining from MULTI-PLATINUM hit makers Florida Georgia Line. Bars on each floor serve local craft beers and inventive cocktails. For more information, visit FGLHouse.com. About Florida Georgia Line: FGL’s PLATINUM-certified musical evolution, DIG YOUR ROOTS, propelled the history-making duo to #1 on the all-genre Billboard Artist 100 and Country Albums charts. Continuing the epic momentum, the album has delivered three consecutive #1 smashes - the 3X PLATINUM-certified lead single “H.O.L.Y.” [#1 on Billboard's Hot Country Songs chart for 18 straight weeks] and PLATINUM-certified hits “May We All” (featuring Tim McGraw) and “God, Your Mama, And Me” (featuring Backstreet Boys) [13th #1 overall as artists]. Following a landmark DIG YOUR ROOTS TOUR that broke attendance records and played to over one million featuring headline-grabbing guest appearances, FGL is currently on THE SMOOTH TOUR 2017. Bursting with first-rate reviews of their explosive live shows, MusicRow Magazine praised, "Just in case you’ve forgotten, Florida Georgia Line is one of the hottest country acts alive.” The superstar duo continues to crush records as the first and only Country act to achieve RIAA’s DIAMOND certification (10 million copies sold) for their breakout smash “Cruise,” which is the best-selling digital country single of all time (SoundScan). Since their breakout in 2012, FGL has earned prestigious honors from the AMA, ACM Awards, CMA Awards, Billboard Music Awards and CMT Music Awards. Their previous BMLG Records releases – 2X PLATINUM debut HERE’S TO THE GOOD TIMES and PLATINUM ANYTHING GOES – have attributed to sales surpassing 29 million tracks and more than 3.5 million albums worldwide. FGL will spread good vibes to sports fans each week during the 2017 NFL season as they’re featured alongside Hank Williams Jr. and Jason Derulo in “All My Rowdy Friends Are Coming Over Monday Night” during Monday Night Football on ESPN. Fueled by fresh inspiration and keen entrepreneurial spirit, they’ve launched publishing company Tree Vibez Music and their own emoji app, FGLmoji. Following the introduction of their Old Camp Pecan Whiskey, their premiere restaurant and entertainment destination FGL HOUSE, a four-story attraction with the largest “Cruise” rooftop Nashville has to offer, is now open. Nashville, Tenn. (May 25, 2017) Nashville, Tenn. (May 25, 2017) – Just in time for the 2017 CMA Music Festival, multi-PLATINUM superstar duo FLORIDA GEORGIA LINE and LRC Group have announced JUNE 5 as the grand opening of their first restaurant and entertainment destination, FGL HOUSE. Doors open to the public at 7 p.m. CT, setting the stage for a party that never ends in the heart of downtown Nashville’s neon-lit Country music paradise. Standing on 120 3rd Avenue South, FGL HOUSE will be an entertainment playground unlike any other, providing visitors with four stories of vibey music, inspired food, and unforgettable good times. Inside the massive venue, guests will be welcomed into the duo’s anything-goes world. Edgy live music focusing on today’s country trends will get fans dancing every day, while bars on all four levels will keep the craft beer and custom cocktails flowing – featuring the duo’s own Old Camp Whiskey. A world-class kitchen will serve up Southern-style fare with a California twist, and patrons are invited to enjoy the huge “Cruise” rooftop bar – the largest in Nashville – complete with stunning views of the Music City skyline. For a completely different feel, visitors can also head down to the chillin’ “Little Red Corvette” basement martini bar, and a gigantic video wall will make FGL HOUSE’s main floor the perfect place to hang with friends and watch your favorite sporting events. Meanwhile, can’t-miss events like Country Club Tuesdays will feature the internationally renowned Dee Jay Silver spinning custom country remixes. VIP membership packages are available at fglhouse.com/vip or at the FGL HOUSE front desk, allowing you and a guest to skip the lines outside and cruise right up to the bar with no waiting and no cover charge (exclusions apply). Members will also receive a special edition T-shirt. Pricing is $100 annually or $250 for a lifetime pass. FGL Lifers – the duo’s new fan club - will receive a 20% discount on FGL HOUSE membership. For more information on Florida Georgia Line and THE SMOOTH TOUR 2017, visit floridageorgialine.com. FGL’s musical evolution DIG YOUR ROOTS propelled the history-making duo to #1 on the all-genre Billboard Artist 100 and Country Albums charts, delivering the 3X PLATINUM-certified lead single “H.O.L.Y.” [#1 on Billboard's Hot Country Songs chart for 18 straight weeks]; PLATINUM-certified hit “May We All” featuring Tim McGraw [12th #1 overall as artists]; and current PLATINUM-certified standout “God, Your Mama, And Me” featuring Backstreet Boys. Following a landmark DIG YOUR ROOTS TOUR that broke attendance records and played to over one million fans featuring headline-grabbing guest appearances. Bursting with first-rate reviews of their explosive live shows, MusicRow Magazine praised, "Just in case you’ve forgotten, Florida Georgia Line is one of the hottest country acts alive.” The superstar duo continues to crush records as the first and only Country act to achieve RIAA’s DIAMOND certification (10 million copies sold) for their breakout smash “Cruise,” which holds the record for the longest #1 on Billboard’s Hot Country Songs chart and is the best-selling digital country single of all time (SoundScan). Since introducing their breakout vibes in 2012, FGL has earned prestigious honors from the AMA, ACM Awards, CMA Awards, Billboard Music Awards and CMT. Their previous BMLG Records releases – 2X PLATINUM debut HERE’S TO THE GOOD TIMES and PLATINUM ANYTHING GOES – have attributed to sales surpassing 29 million tracks and more than 3.5 million albums worldwide. Fueled by fresh inspiration, they launched publishing company Tree Vibez Music. Following the introduction of their Old Camp Pecan Whiskey, their premiere restaurant and entertainment destination FGL HOUSE, a four-story attraction with the largest “Cruise” rooftop Nashville has to offer, will also open summer 2017. Old Camp Peach Pecan Whiskey is a smooth whiskey created by country duo Florida Georgia Line as the ultimate start to any party. Old Camp is blended using American whiskey aged for a minimum of two years in white American oak barrels with a No. 3 char and infused with Southern peach and pecan flavors. Old Camp Peach Pecan Whiskey is 70 proof (35% alcohol by volume) and is available for purchase at select retailers nationwide. For more information, please follow Old Camp Whiskey on Facebook and Instagram at @oldcampwhiskey or visit http://www.oldcampwhiskey.com. Nashville, Tenn. (May 10, 2017) – Multi-platinum superstars FLORIDA GEORGIA LINE are proud to announce the establishment of their first restaurant and entertainment destination, a four-story attraction in Nashville’s trendy SoBro district called FGL HOUSE. Opening in early summer 2017 in partnership with LRC Group, FGL HOUSE will welcome guests inside the hitmaking duo’s anything-goes world, four levels of good times and vibey tunes designed to make each visitor a part of the FGL tribe. “What excites Tyler and I the most is always staying creative. We love seeing what fresh things we can come up with to take our music to a new level and turn our dreams into reality,” shares Brian Kelley. Situated on 3rd Avenue South in the Country music mecca of downtown Nashville, the new venue will feature edgy live music every day – focusing specifically on today’s country trends. A world-class kitchen will fuse unique Southern style cuisine with California flair, and bars on each floor will serve local craft beers and deliciously mixed cocktails – many featuring the red-hot duo’s own Old Camp Whiskey. FGL HOUSE will also boast the largest “Cruise” rooftop Nashville has to offer, dedicated to an all-day and all-night party with stunning views of the Music City skyline. Meanwhile, visitors can step away from the hustle and bustle to relax in a classy basement-level lounge, complete with its own baby grand piano, cocktail menu inspired by ‘90s pop culture and specialty martinis. A massive, awe-inspiring video wall will continuously showcase the hottest video content from Florida Georgia Line and other country stars – as well as all your favorite sporting events – and the internationally renowned Dee Jay Silver will spin custom country mixes during can’t-miss Country Club Tuesdays. More information about FGL HOUSE will be revealed soon. To stay up-to-date, visit fglhouse.com. FGL’s musical evolution DIG YOUR ROOTS propelled the history-making duo to #1 on the all-genre Billboard Artist 100 and Country Albums charts, delivering the 3X PLATINUM-certified lead single “H.O.L.Y.” [#1 on Billboard's Hot Country Songs Chart for 18 straight weeks]; PLATINUM-certified hit “May We All” featuring Tim McGraw [12th #1 overall as artists]; and current GOLD-certified standout “God, Your Mama, And Me” featuring Backstreet Boys. Following a successful sold-out trek last year that broke attendance records, played to over one million fans and featured headline-grabbing guest appearances, FGL continues to dominate on the road with their nationwide DIG YOUR ROOTS TOUR, including Dustin Lynch and Chris Lane along with Ryan Follese, Seth Ennis and Morgan Wallen on select dates. Bursting with first-rate reviews of their explosive live shows, MusicRow Magazine praised, "Just in case you’ve forgotten, Florida Georgia Line is one of the hottest country acts alive.” The superstar duo continues to crush records as the first and only Country act to achieve RIAA’s DIAMOND certification (10 million copies sold) for their breakout smash “Cruise,” which holds the record for the longest #1 on Billboard’s Hot Country Songs chart and is the best-selling digital country single of all time (SoundScan). Since introducing their breakout vibes in 2012, FGL has earned prestigious honors from the AMA, ACM Awards, CMA Awards, Billboard Music Awards and CMT and is currently nominated for six Billboard Music Awards, airing live on May 21 on ABC. Their previous BMLG Records releases – 2X PLATINUM debut HERE’S TO THE GOOD TIMES and PLATINUM ANYTHING GOES – have attributed to sales surpassing 26 million tracks and more than 3.5 million albums worldwide. Fueled by fresh inspiration, they have also launched publishing company Tree Vibez Music and introduced Old Camp Peach Pecan Whiskey. Old Camp Peach Pecan Whiskey is a smooth whiskey created by country duo Florida Georgia Line as the ultimate start to any party. Old Camp is blended using American whiskey aged for a minimum of two years in white American oak barrels with a No. 3 char and infused with Southern peach and pecan flavors. Old Camp Peach Pecan Whiskey is 70 proof (35% alcohol by volume) and is available for purchase at select retailers nationwide. For more information, please follow Old Camp Whiskey on Facebook and Instagram at @oldcampwhiskey or visit www.oldcampwhiskey.com. We're just getting started. Be the first to know our event schedule, exclusive offers, and more!